ROOSEVELT, FRANKLIN D. (1882-1945). Thirty-second president of the United States. 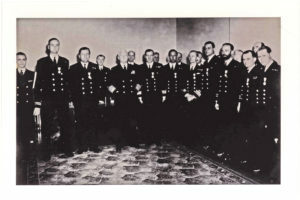 DS as “Commander-in-Chief.” (“Franklin D. Roosevelt”). 1p. Oblong Small Folio. Washington, January 4, 1945. 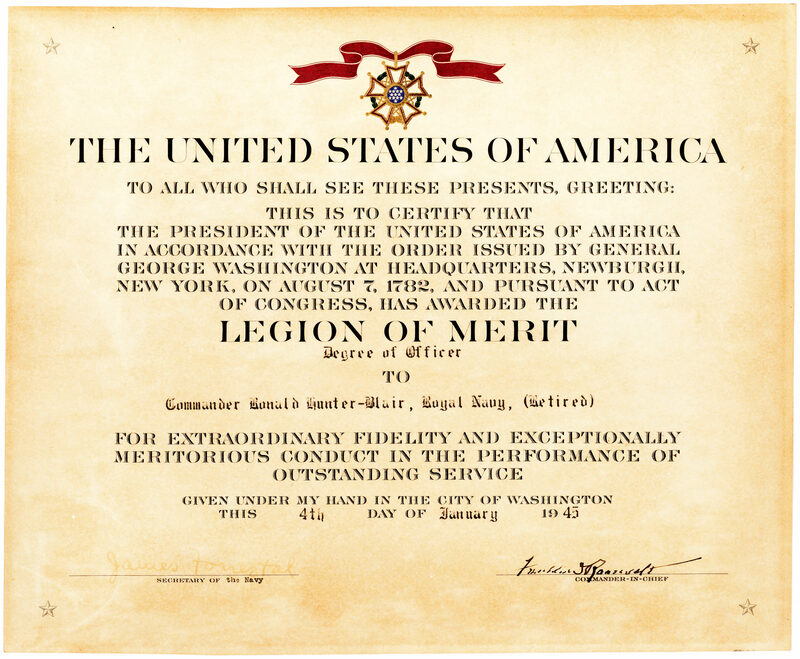 A Legion of Merit certificate issued to RONALD HUNTER-BLAIR (1894-1961) countersigned by Secretary of the Navy JAMES FORRESTAL (1892-1949, “James Forrestal”). FDR’s presidency spanned nearly the entirety of the U.S. involvement in WWII, during which time the president crafted a powerful coalition with Great Britain and the Soviet Union. By early 1944, however, Roosevelt was gravely ill, a fact he hid from the press and the American people. 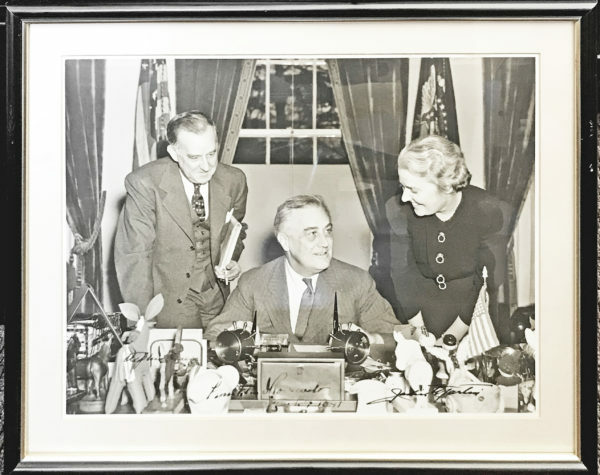 Suffering from high blood pressure, coronary heart disease and congestive heart failure, his physician prescribed rest, but on April 12, 1945, fourteen weeks after signing our document, FDR suffered a fatal brain hemorrhage. Forrestal was a naval aviator during World War I and became Roosevelt’s Undersecretary of the Navy, upon the establishment of the office. 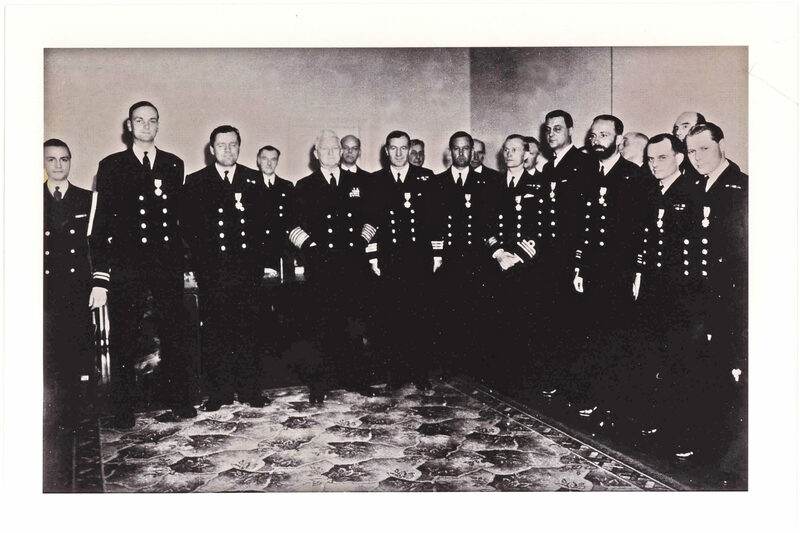 His success at mobilizing the industrial output necessary for the war effort, led to his promotion as Secretary of the Navy in 1944 in which capacity he travelled to the front and witnessed the Battle of Iwo Jima first hand. In the final months of the war, Forrestal advocated for a more lenient relationship with Japan in order to allow the country to surrender with dignity; his advice was followed only after two atomic bombs were dropped on Hiroshima and Nagasaki and failed to produce an unconditional surrender. 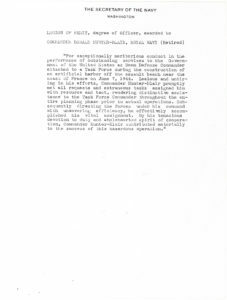 It was Forrestal who counseled Truman to accept the Japanese surrender “with the understanding that said declaration does not comprise any demand which prejudices the prerogatives of His Majesty as a sovereign ruler” and to state that it accomplished the demands of the Potsdam Declaration, allowing the Japanese government and emperor to rule subject to the orders of the Supreme Commander of the Allied Powers. Under Truman, Forrestal served as this country’s first secretary of defense until he was fired in 1949 for having secretly met with Truman’s 1948 presidential opponent, Thomas E. Dewey. Shortly afterward, Forrestal was hospitalized for psychiatric problems and died under suspicious circumstances at the National Naval Medical Center (Walter Reed National Military Medical Center). Our award’s recipient, Ronald Hunter-Blair, was a veteran of World War I and a POW. He fought during the Russian Civil War in 1919 and served in military intelligence. 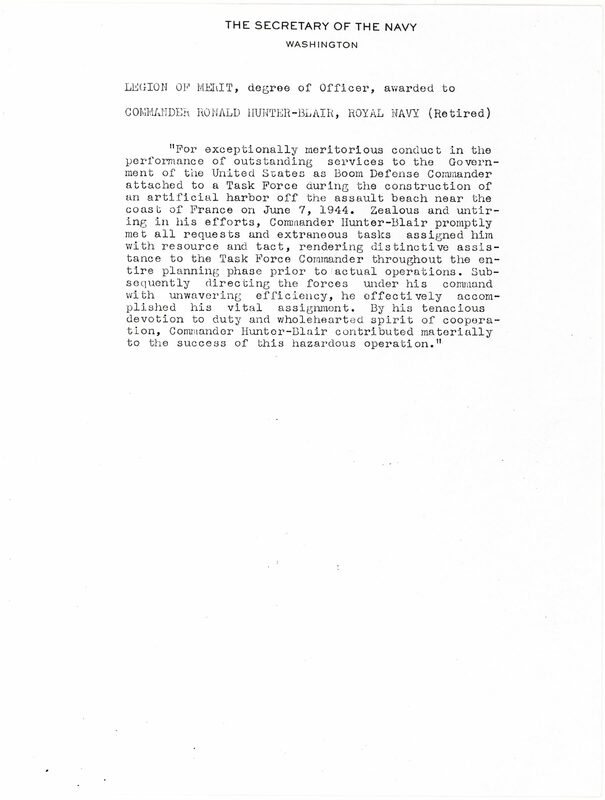 Promoted to the rank of Lieutenant-Colonel in the Gordon Highlanders and admitted to the Royal Company of Archers, Hunter-Blair was awarded the Legion of Merit by Roosevelt for his “exceptionally meritorious conduct in the performance of outstanding services to the Government of the United States as Boom Defense Commander attached to a Task Force during the construction of an artificial harbor off the assault beach near the coast of France on June 7, 1944,” during the Allied invasion of Normandy. The Legion of Merit is an honor bestowed on both members of the United States Armed Forces as well as those of foreign military organizations and governments. Some irregular toning and slight rippling along the edges. 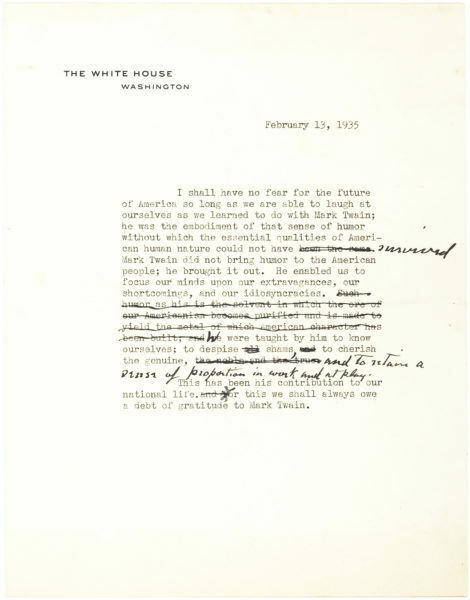 Due to Forrestal’s preference for green ink, his signature has become very light, with Roosevelt’s shaky signature signaling his worsening health. In very good condition. 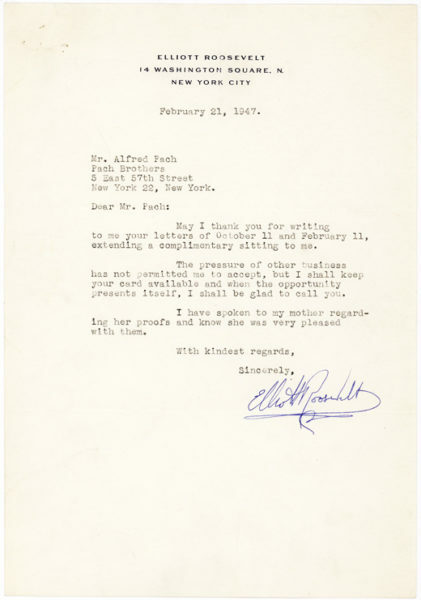 In more than 40 years, only one other similar document signed by FDR has appeared at auction.